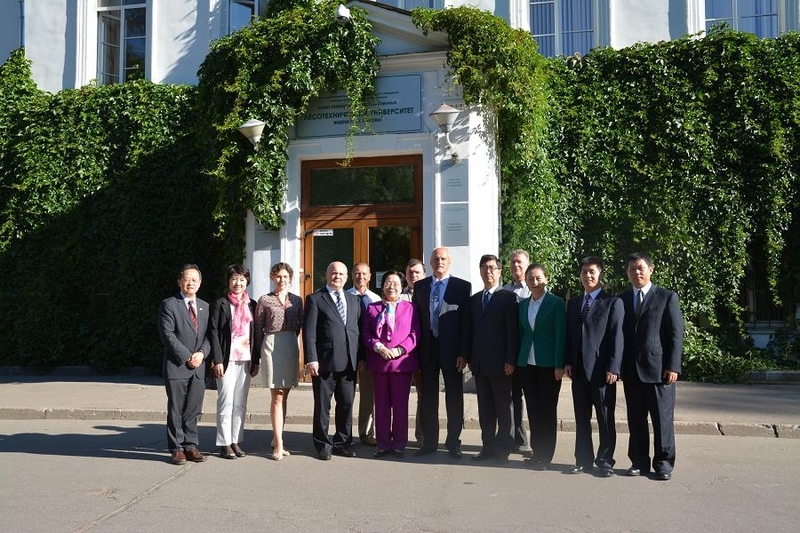 On August 24th, 2015, Jiang Zehui, Deputy Director of CPPCC Committee of Population, Resources and Environment, Co-chairperson of International Network for Bamboo and Rattan (INBAR), Director General of International Centre for Bamboo and Rattan (ICBR), led a delegation to St. Petersburg Forestry Technical University (SPbSFTU). President Jury Belenkij warmly welcomed the delegation. He spoke highly of Professor Jiang Zehui for her academic achievements in wood and bamboo science during the past several decades, and awarded her honorary PhD of SPbSFTU with a medal for outstanding contribution. This is the 15th honorary PhD awarded to people other than Russian, which is usually given to prominent scientists or leaders in forestry internationally. Prof. Jiang Zehui appreciated the invitation of SPbSFTU and its contribution to cultivating advanced forestry talents for China. Jiang Zehui and Jury Belenkij signed the Memorandum of Understanding between International Centre for Bamboo and Rattan and SPbSFTU. The two parties will strengthen scientific cooperation and communication in processing, breeding and genetic improvement in bamboo and wood as well as city forestry. SPbSFTU is one of the ten great forestry institutions in Europe and the world’s oldest advanced forestry institution with international reputation and over 20,000 students. Professor Peng Zhenhua, China’s famous forester and ecologist, graduated from SPbSFTU in 1964 with vice-doctorate in biology.